Here is an article I wrote for my website ( www.wallacesmedley.com ) and thought I would share here to get some feedback. Thanks! When we practice martial arts, we must always keep in mind two very different concepts. These concepts are use and training. In this article I am going to look at the two concepts, and try to walk away with a better understanding of both. While the old adage states, “The way you practice is the way you perform”, is this really what we are looking for in the Chinese martial arts? When I am speaking of practice, for the purposes of this article, I am speaking about the training of forms in general and the techniques within the forms specifically. 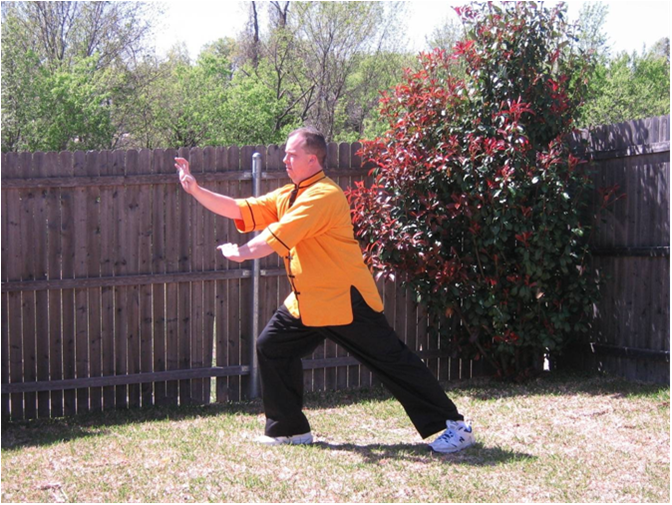 In Hung Gar, as well as any other martial art, when we practice forms, we may have an idea of what the different techniques mean, but there are times when we may wonder if it is really effective (especially when we first enter the world of practical and real-time application). In this technique there are several questions which must be answered before one can understand the application. Why is the bottom hand positioned with the wrist at that angle as opposed to bent to another angle or straight? Why are the fingers curled the way they are? Why are the elbows positioned that way? Would any changes to the wrist, elbow, or hand positions render this technique useless? One often overlooked and extremely important note is that situation is going to determine use, and the use is going to determine correct and incorrect. In the above posted technique, if the upper hand is being used to deliver a strike, then the wrist of the striking hand is going to need to be bent back as shown, and the fingers are outstretched in order to avoid jamming or breaking them. If the top hand is being used to redirect a limb of the opponent, then the fingers are going to need to be curled a little more than they are shown, as well as the thumb needing to be placed a little further out from the palm. There are a host of questions that need to be asked about the bottom hand and the stance as well. But I think this point is made. Too often, people get stuck with the idea that stances are for training leg strength. True, this is something that training in stances does give you. But there is so much more to be had, and in order to reach higher levels of understanding, one must let go of some concepts that have become very commonplace. One must destroy the idea that stances are in any way intended to be static postures. They are not. Stances are transitional postures. I cringe when I hear people claim that stances are not used in fighting because they are just a method of training the strength of the legs. If there is nothing more to stances than that, why not simply hit the gym and do leg presses a few times per week, and gain much more leg strength in less time, and drop their use in forms altogether? The stances are transitional postures that allow for the maximum transfer of power into the opponent through the technique. Stance is essential in how we generate power in our techniques. In the forms the stances are there to allow us an understanding through experience as to exactly how stances factor in to the generation of power in the techniques. To stay that the stance is only to build leg strength is to show one’s ignorance. In the traditional martial arts, the stances were put there for a reason. The reason may vary slightly from style to style, but in general it will be tied to strategy and maximum transfer of power. The choice of which stance follows which is going to be tied to the idea of the footwork needed in order to properly position yourself and make the system’s overall strategy come alive and be effective. Through the practice of forms, we train the style or system. The mere rote practice of forms can be compared to buying a book on…I don’t know…theoretical physics. You can have the book, read it every day and so on. But until you attend a class where a professor starts to explain what is in the book, and how it all ties together, all you are going to have is superficial understanding (at best), and no real in-depth knowledge. Another point often missed is that the way a technique looks when performed correctly in a form will not always be the way it looks when correctly used in application. For example, correct in a form (speaking on Hung Gar) is going to be a solid, wide and low stance, shoulders in a specific position relative to the position of the hips, etc. In application, correct is going to have to do with the details of timing, and distance in relation to where the opponent is (and what he is doing), how you deal with the attacking limbs of the opponent and position yourself to deliver your attack while maneuvering into a position which makes his attack impossible or at least very difficult to pull off, etc. The stances will remain important for structural purposes and delivery of force. There is a dichotomy. But when we understand the value given to us, there is no need to act as if there is a problem. Provided the instructor is knowledgeable enough to explain how and why the use (application) will differ from the training (forms or techniques), there is no problem. Nice article! I l like it! Very good article and a big support to understand Funakoshi`s rule about the difference of studying Kata and applying (for me: understanding) the techniques in fight. Through the practice of forms, we train the style or system. The mere rote practice of forms can be compared to buying a book on…I don’t know…theoretical physics. You can have the book, read it every day and so on. But until you attend a class where a professor starts to explain what is in the book, and how it all ties together, all you are going to have is superficial understanding (at best), and no real in-depth knowledge." Yes, agreed, whole heartedly. Nice article.